Parker New York is a 729 room 4 star full service hotel situated in the heart of Manhattan most iconic sites. We juxtapose contemporary culture with timeless design and unexpected indulgence. Parker New York is steps from Central Park the bright lights of Broadway and Fifth Avenue shopping. Enjoy fashionable rooms many with fantastic views. Catch great eats with NORMAS for breakfast all day everyday Knave for a morning espresso or an evening in Manhattan Indian Accent for an elegant dining experience or the burger joint for just great burger no complication no confusion. 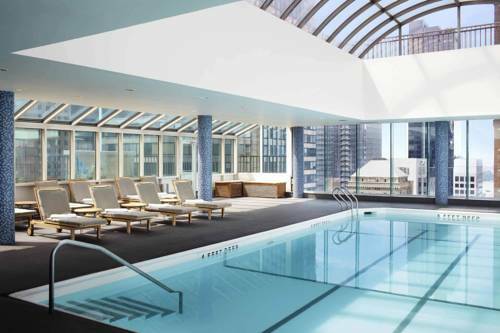 Experience our one stop shop for the best in fitness and beauty basics in the underground or swim high in the sky in the penthouse pool. Parker New York offers spectacular banquet space and meeting professionals to cater to your every need. Parker New York Uptown Not Uptight. Situated in the heart of Manhattans most iconic sites we juxtapose contemporary culture with timeless design and unexpected indulgence. Parker New York is steps from Central Park the bright lights of Broadway and Fifth Avenue shopping. Reservation cancelled or changed after 3pm hotel time 48 hours prior to arrival date are subject to a 1 night room and tax penalty. Breakfast for lunch? Always! Lavish breakfasts and brunches are our specialty with memorable creative morning fares that are easy to share. The best burger in New York City hidden behind the curtain in the atrium lobby of The Parker Hotel. Our master barista bartenders have an arsenal of delicious cocktails a well chosen wine list tasty snacks and the best coffee in Midtown. Indian Accent offers an inventive approach to Indian cuisine. The menu reinterprets nostalgic Indian dishes with an openness towards global techniques and influences. Chef Manish Mehrotra highlights distinctly Indian flavors on a contemporary menu.